“What does NE stand for?” my five-year-old son asked as we watched last night’s Super Bowl LI. I told him it stood for the New England Patriots. “No! Change it!” he shouted, lunging for the Xbox One controller. 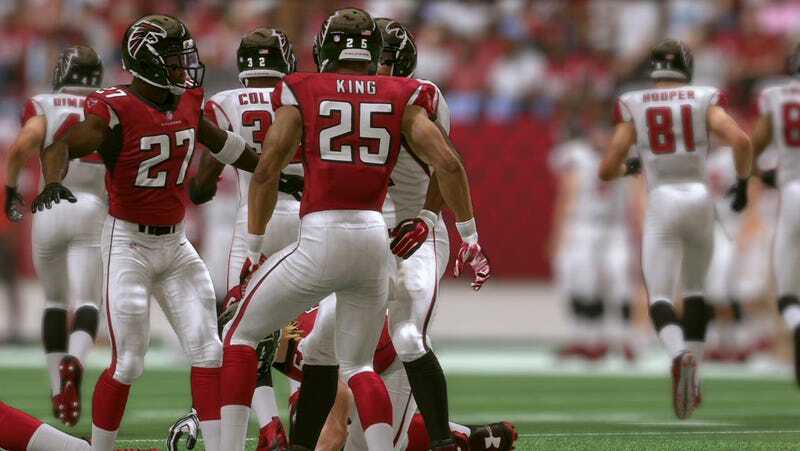 “It should be Atlanta versus Atlanta!” Oh right, Madden 17. Minutes into Super Bowl LI it was clear that Seamus was not happy with the game. While Archer happily played his iPad in the direction of the television, his brother was fidgety and anxious. They look just as confused as I was. At first I figured he was just excited to see his team play. This is the first year that Seamus has been really aware of the Super Bowl—normally we get a sitter and go over to my parents’ place to watch the game or just skip it entirely. But we live in Atlanta, and the Falcons making it to the Super Bowl is an enormous deal here. Seamus’ school held a spirit day, to which he insisted he wear all black and red (we managed all but the shoes). Saturday night, before putting the boys to bed, I asked if they were excited to watch the Super Bowl tomorrow. Seamus answered an enthusiastic yes, while Archer hid under the covers with the iPad he wasn’t supposed to have at bedtime. What was causing last night’s unease was an issue I hadn’t taken into account. Everything Seamus knows about football, he learned from playing Madden NFL on the Xbox One. While he and his brother mainly watch as I played Madden 16, I often find Seamus sitting in the living room with Madden 17 on the screen, pressing the buttons that make the polygonal players move. Seamus’ most recent game didn’t get very far, but Atlanta was clearly in the lead. Now, as I’ve mentioned previously on Kotaku, Seamus and Archer are on the autism scale, and share a particular love of letters and numbers. It’s one of the reasons they enjoy sports games. They all have numbers in the name. Seamus likes his letters and numbers to be in order. When I play Rock Band for them I have to play the songs in alphabetical order, which has led me to reinstalling the game and buying all the songs I enjoy that begin with numbers or the letter A. So when Seamus is given a choice of NFL teams to play, he chooses the Atlanta Falcons. Why not the Arizona Cardinals? Not sure, but I think it has something to do with the fact that he pronounces “Atlanta” as “Alanta.” And when he is given the option to choose an opponent, he also chooses the Atlanta Falcons. And so I spent the first half of Super Bowl LI dealing with a very angry little monkey who could not understand why Atlanta wasn’t playing against Atlanta. I tried. This went on for a good hour, interrupted by the occasional angry storming out of and then back into the living room. I would try to explain that this was a real football game and we had no control over it, he would insist in a loud, unpleasant kid screech that yes we did. Not a fun way to watch a major sporting event. Eventually Seamus calmed down, and the soothing music and explosions of Lady Gaga’s halftime show lulled him gently to sleep. Poor kid missed getting to see the part of the game where Atlanta played against itself for real. Pretty sure the Patriots are going to win this one as well.